Air Sharing lets you easily copy files between your iPhone and a wirelessly-connected Mac. By doing so, Avatron Software’s app addresses one of the most frequently lamented shortcomings of Apple’s mobile devices—their lack of storage space for documents and similar files. That makes Air Sharing a dream come true for mobile workers and productivity gurus. Once stored on your iPhone, you can view many file types within Air Sharing. Air Sharing connects to your Mac over a wireless connection. When you use Air Sharing for the first time, the program offers thorough instructions on how to set up the app to work with your network. This means following the Finder’s “Connect to Server…” dialogue boxes and entering Air Sharing’s IP address at the prompt in your Mac’s Finder window. The entire process takes only a few minutes, and you can customize both a password to protect your files on your iPhone, or assign a different port number should you need it. When the iPhone appears as a shared disk in the Finder window, your set up is complete. Adding new files via Air Sharing is as simple as dragging-and-dropping them onto the Air Sharing disk icon in the Finder window. You can load individual files or entire folders. The app supports most major file types including documents, spreadsheets, PowerPoint presentations, PDFs, pictures, MP3s, MPEG-4 videos, and Apple’s own iWork formats, among others. Viewing documents is easy and relatively straightforward. 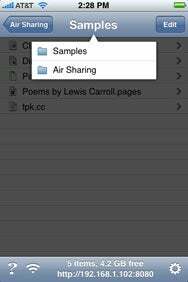 Air Sharing displays documents and other files in both portrait and landscape views. Air Sharing supports a “tree table” file hierarchy, which organizes your files into folders. Tap on a folder to drill down into its contents. A button at the top of the screen takes you back up the hierarchy, one folder at a time. To view a file, just tap it. Files load quickly; you can scroll and resize documents and PDFs with the now familiar finger swipe and pinch. While navigating files in Air Sharing is generally easy, I did find poking around a lengthy document or PDF especially frustrating. Air Sharing does not offer a way to scroll to a specific page or part of a lengthy document. For example, I loaded a 50-page instruction manual PDF; if I want to read a paragraph on page 36, I have to scroll with my finger until I arrive on page 36. While reading large documents on an iPhone is hardly ideal, it is nonetheless frustrating that Air Sharing does not make navigating them easier. That said, Air Sharing remains a convenient way to transfer files from your Mac to your iPhone, and then access them quickly. For anyone looking to carry important documents with them on the go, the app is a solid choice. Air Sharing is compatible with any iPhone or iPod touch running the iPhone 2.x software update.